Nice's most famous market area, the Cours Saleya, bustles with activity every day and is a riot of colour and fresh smells. Cours Saleya is the famous promenade in the southwest of Vieux Nice. A wonderful attraction for visitors, and beloved by locals, the market is packed with flowers, fresh produce, souvenir shops and sidewalk cafés. 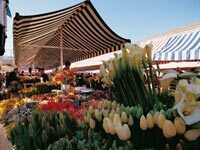 On Mondays the flowers and fresh produce disappear and instead the area hosts a large flea market and an antiques market; even those not looking to buy anything can enjoy the food and soak up the vibrant atmosphere. The promenade and square which house the stalls are impressive too and the backdrop of venerable buildings contrasts pleasantly with the riotous colour and frivolity of the market. It is best to arrive as early as possible to enjoy the market before the hordes descend. Also, those planning to do some shopping should be sure to have plenty of change and small bills because the merchants do not like to break large bills and may refuse if they don't have sufficient change. Opening times: Tuesday to Saturday from 6am to 5.30pm. Closed Sunday afternoons and Mondays.